Disco no go, Disco no go – HubNut – celebrating the average! Yesterday, I investigated the non-starting problem that saw me undertake a nervy 70 mile drive in a Land Rover Discovery I dare not stall. While consuming the first all-important brew of the day, I checked online to see how much a new starter motor would be. Expensive enough to have me looking for alternatives! I wasn’t entirely sure it was the starter motor anyway, so the chances of me blowing £200 on a quality replacement were not very high. It sounded more like a power issue, as the motor would turn, just very, very slowly. No Go number one. The multimeter confirmed that it was charging properly. Could it be an earthing issue? 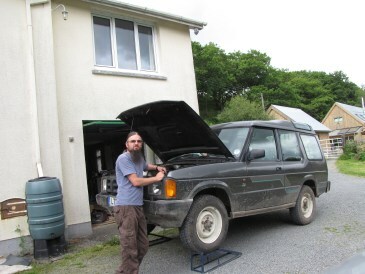 Having recently been tipped off that there was a proper, old-school Landy specialist hidden in the hills nearby, I decided it was time to pay a visit. Naturally, the Landy wouldn’t start, so I went in the 2CV. There, we discussed likely scenarios. Probably a duff earth, so he gave me a new cable. Then he explained that if the earth fails, Discos usually start using the handbrake cable instead. One customer had had her handbrake seize entirely because of this. Given that the handbrake on mine was noticeably notchy all of a sudden, I began to suspect that this is what had happened. Fitting the new earth cable took seconds. As recommended, I took it straight from the negative terminal to the timing case. The Disco fired merrily into life. Huzzah! That meant I could actually drive it up on to my ramps to make it easier to examine the handbrake cable. In fact, what actually happened is that having got it running, I set off for a test drive so I could get it nice and hot before trying to turn off and on again. However, I noticed that the handbrake wasn’t working at all. I stupidly yanked it harder, which worked! It then wouldn’t release. No Go number two. I dropped it into low box for extra grunt and reversed gently backwards and drove onto the ramps again, cursing my stupidity. I headed back inside, cursing my inability to purchase a manual for my Disco as I had to keep looking stuff up on forums. Aren’t forums a brilliant idea? 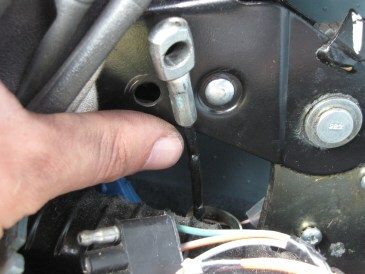 Then I pulled apart the centre console so I could disconnect the handbrake cable. It looked wrong. You can just about see that below the silver metal ferrule is a black mess that should be a shiny, metal cable. After disconnecting inside, I headed underneath to find the other end. Sadly for me, it seems that someone has fitted a 300Tdi transfer box. Land Rover kindly saved themselves a few pennies by changing the handbrake cable. Instead of attaching outside, where you can easily get at it, it goes right into the handbrake drum. So, you have to disconnect and move the rear prop, then get the drum off to access it.